Safety glasses must be worn at all times in work areas. / Long and loose hair must be contained. / Hearing protection must be worn. Sturdy footwear must be worn at all times in work areas. / Close fitting/protective clothing must be worn. / Rings and jewellery must not be worn. Locate and ensure you are familiar with all machine operations and controls. Ensure all guards are fitted, secure and functional. Do not operate if guards are missing or faulty. Ensure the saw is properly secured to a work table by bolts/clamps at approximately hip height. Ensure the saw is operated on an RCD protected circuit. Check workspaces and walkways to ensure no slip/trip hazards are present. Keep table and work area clear of all tools, off-cut timber and sawdust. Start the dust extraction unit before using the machine. Ensure all adjustments are secure before making a cut. Use clamps to secure and support the workpiece to a stable platform. Do not use a length stop on the free scrap end of a clamped workpiece. Before turning on the saw, perform a dry run of the cutting operation to ensure no problems will occur when the cut is made. Avoid reaching over the saw line. Do not cross arms when cutting. When pulling the saw down with your right hand, keep the left hand, especially the thumb, well clear of the line of cut. If workpiece is bowed or warped, clamp it with the outside bowed face toward the fence. After finishing the cut, release the switch, hold the saw arm down and wait for blade to stop before removing work or off-cut piece. Before making any adjustments,disconnect the plug from the power source and bring the machine to a complete standstill. Leave the machine in a safe, clean and tidy state. Saw may grab and ‘kick-back’ toward operator. Flying chips and airborne dust. Do not use faulty equipment. Immediately report suspect equipment. Do not exceed the maximum cut for the machine. Do not cut more than one workpiece at a time. Do not start the saw with the blade touching the workpiece. Allow the blade to reach full speed first. Do not cut branches, dowel, or wood with embedded nails or screws. Do not rip solid timber along the grain. Do not cut ferrous or non-ferrous material. This SWP does not necessarily cover all possible hazards associated with this equipment and should be used in conjunction with other references. 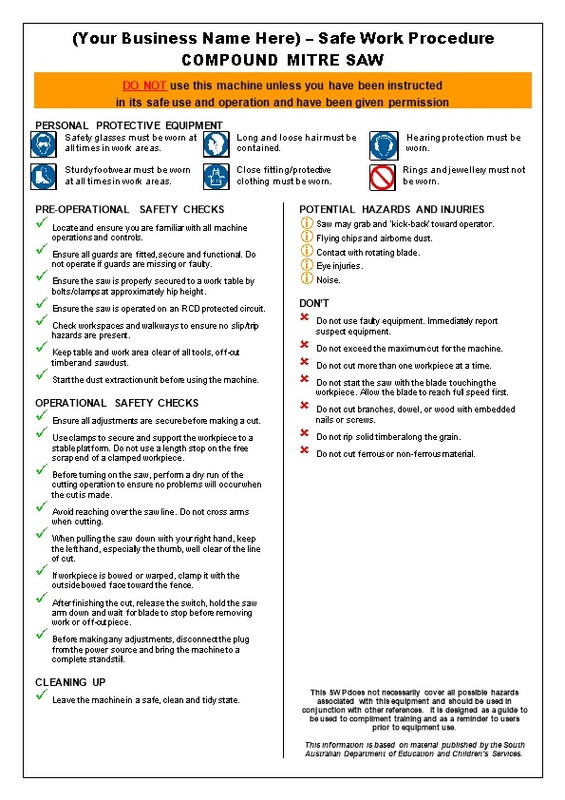 It is designed as a guide to be used to compliment training and as a reminder to users prior to equipment use. This information is based on material published by the South Australian Department of Education and Children’s Services.